Are you itching to start your spring planting? We understand, but you’re rolling the dice this time of year since we’re still too far out from the official start of spring; future snow storms and freezes are a given. The good news is you can still put those green thumbs of yours to work by creating container garden designs and layouts that will add early spring cheer to your porches, plant beds, and patios. Container gardens are becoming quite the rage. They are versatile, easy to manage, and portable. That latter quality is especially desirable in a climate where having the wherewithal to move containers in and out, depending on the weather report, allows you to enjoy early and late landscape interest when the rest of your neighborhood is surrounded by a sea of winter grays. Use these tips to create cheerful spring container gardens, even while the snow flies. Keep containers consistent. It’s easy to get carried away with the myriad of container designs, textures, and colors out there. However, if you go too crazy, it can look like a big mish-mash, rather than a well-designed landscape arrangement. 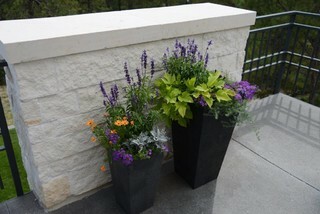 Try to keep your containers consistent, especially within the same grouping, so the plants and blooms remain the same. If, on the other hand, you have a few prized containers that you want to show off, consider keeping a pot or two empty altogether this year, or plant them with a single tree, grass varietal, or other plants with upward movement, so the plant and container aren’t in competition. Use a color wheel. If you aren’t naturally creative or artistic, choosing your flowers and plants can be daunting. Grab a color wheel, and use it to assist you. Complementary colors lie directly across from one another on the wheel, and analogous colors lie side by side in groups of threes. Skip the groupings altogether. If you’re planting your containers in a pinch, forget the idea of using multiple plants in the same pot, and keep it simple by using one plant per container. Then, when you have a minute, you can play around by grouping the containers together to create monochromatic or colorful displays and to yield the variations in height that will make your container garden more interesting. Looking for new ideas for your containers this year? 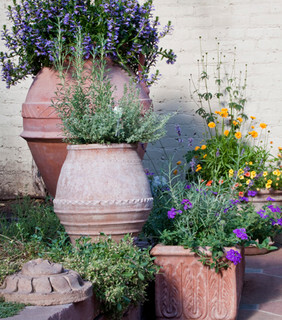 Call on Lifescape, and our design team will be happy to create and maintain your container gardens for you.